There's sadly no Dunkin' in a penalty box. In a move that would make Jack Donaghy proud, NBCSN was able to utilize a bit of synergy during Wednesday’s Rangers-Bruins game and found a prime opportunity to air a commercial that was coincidentally taking place during the game. It all started in the second period where right winger David Pastrnak got busted for hooking and was heading to the penalty box. 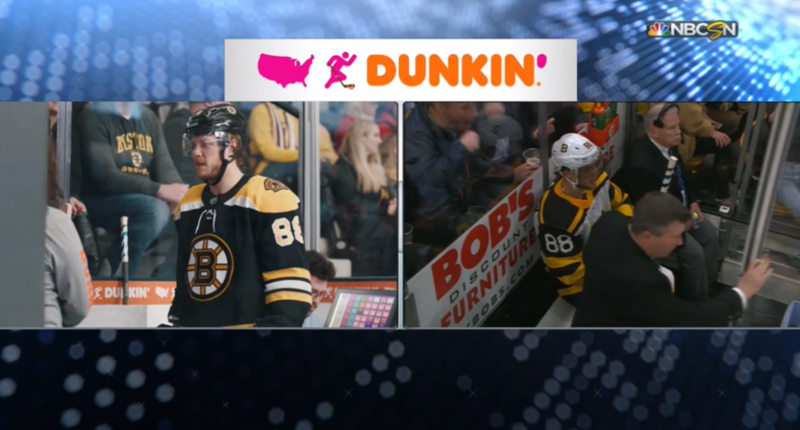 As that was going on, NBCSN decided to go split screen and show a Dunkin’ (formerly Dunkin’ Donuts) commercial featuring Pastrnak entering the penalty box in the commercial at the same time as he was during the game, just wearing a different jersey. Clearly, the penalty box that has a Dunkin’ inside is the better setup but it’s too bad that’s the commercial version. Pastrnak didn’t let the penalty or the commercial affect his play as he led the Bruins with a hat trick and two assists in a 6-3 win.